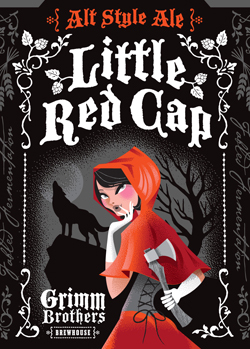 Little Red Cap is Grimm Brothers Brewhouse’s version of an altbier. Indigenous to Düsseldorf, altbiers are top-fermented, full of hops and with a winsome copper color. Amber-red with a rich aroma of butterscotch and a gentle hint of chocolate. Peppery hops kick in on the palate with continuing notes of butterscotch, tangy fruit and biscuit malt. The finish is dominated by spicy hops and tart orange fruit, with toffee and malt notes. It’s perhaps a tad too bitter to be genuine altbier. This has a beautiful copper color leaning into reddish brown with a slight haze. The nose is curious—some licorice, some roast, some caramel, a touch of sherry. It’s lightly hopped for an altbier, but also surprisingly dry, even flinty, with a balanced, linear flavor. It’s quite drinkable, but it has no exciting suggestions to make. Sometimes that’s what you want. For my part, I suggest a loaded cheeseburger, for which this beer will provide a perfect foil.